The VRX Air 2.0 mesh jacket features a performance cut and a waterproof removable zip-out liner. Strong Armor-Link 3 mesh construction with 600 denier Carbolex® fabric in the impact areas ensure sport riding performance in warm days. 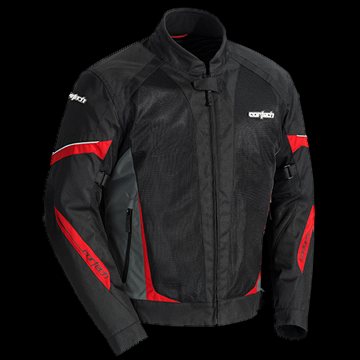 CE-approved armor in the shoulders and elbows combine with a triple-density back protector to make the VRX Air 2.0 a great performance riding jacket value. • Performance cut, abrasion-resistant 600 denier Carbolex® polyester and Armor-Link 3 mesh shell. • Rainguard® waterproof and breathable zip-out liner. • Pre-curved and rotated sleeves for optimum fit while riding. • Removable CE-approved armor in the shoulders & elbows & an articulated triple-density back protector. • Microfiber-lined mandarin collar and hook and loop adjustable microfiber-lined cuffs. • Accordion stretch panels at the waist and elbows increase riding comfort. • Includes an 8" jacket/pant zipper attachment panel (Zipper not included).